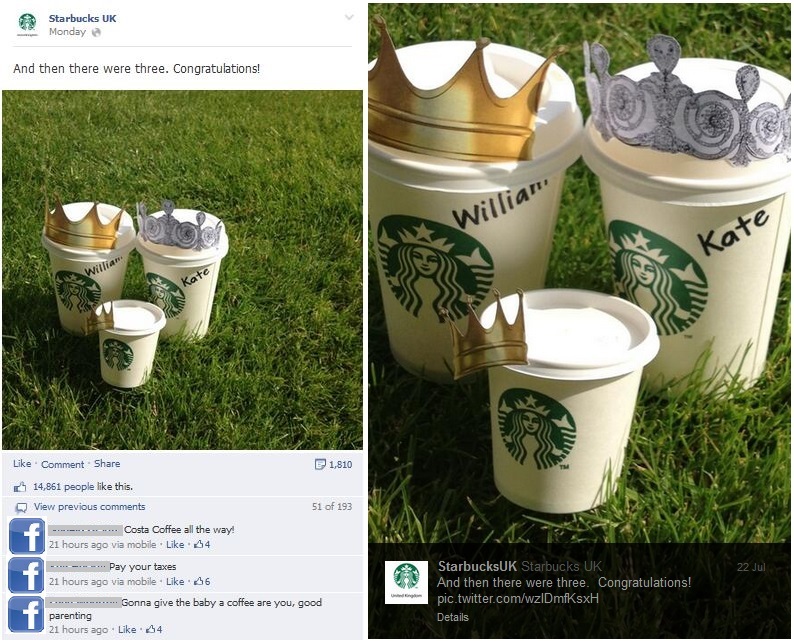 Royal baby – what can you learn from the biggest brands’ reaction? Since 22nd, July, almost all the media in the world has been obsessed with one topic. The royal baby. The biggest brands also joined the buzz about the newborn third in line to the throne, as it usually happens in the case of all big events. 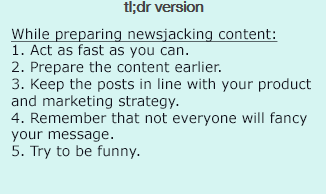 Sotrender checked whether they took advantage of this opportunity and which examples of real time marketing (called also newsjacking) proved the most successful. Keep reading to learn about best practices to implement in the occasions like that. Not only traditional media, but also social media has been totally swamped with the information about royal baby boy as well as analyses of the buzz related to it. According to Socialbakers on 22nd, July, hashtag #royalbaby was used on Twitter 746 785 times! What are the conclusions that social media managers and marketing communications specialists should draw from it? We’ve chosen 10 posts of brands most frequently mentioned in the media such as Digital Trends, Mashable or The Drum that communicated with reference to royal baby. 7 of them were posted on 22nd, July between 20:41 and 20:55 and 3 of them were published around 16-20h later (the next day). 7 out of 10 brands simultaneously published identical posts on FB and Twitter. Coca Cola and Magnum chose Twitter and didn’t publish on Facebook at all, while Nescafe published two different posts related to royal baby on Twitter and Facebok. What can we learn from them? 1. Be fast – what counts it’s the fastest possible reaction even if the event takes place after regular working hours. Oreo published its post soon after the official anouncement of baby birth. 2. Be preprared – the post must be prepared earlier as the event sometimes may be foreseen or is expected to happen – in th case of royal baby the pictures definitely weren’t created during the first 10 minutes after the birth. 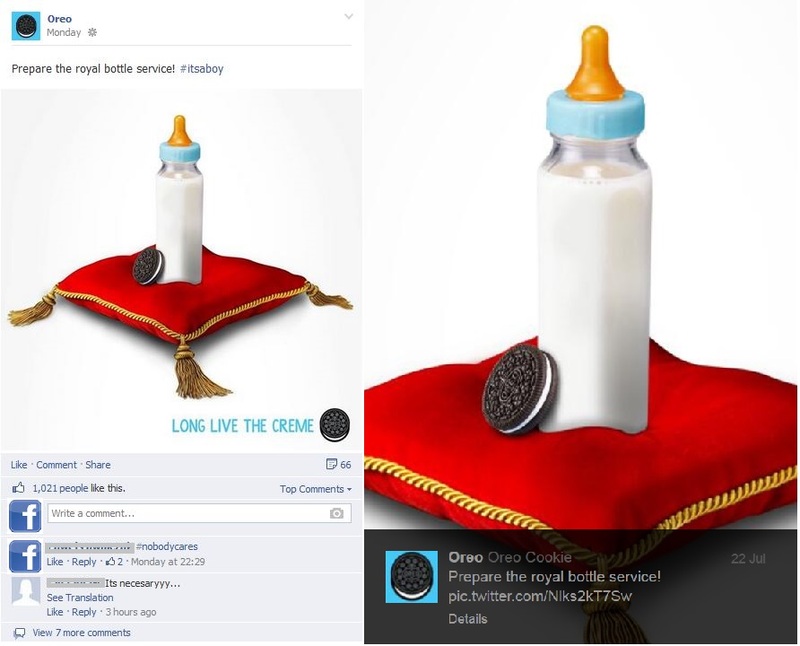 The post published by Oreo is one of the most popular publications of brands concerning royal baby. Oreo published it only several minutes after the official announcement of the birth. But while on Twitter the publication gained multiple retweets, Interactivity Index i.e. collected rate of all the activities within a page on Facebook, for 22nd, July remained below average. 3. Keep the posts in line with your product and strategy – all the post were related to royal baby in more or less comic way like the ones of Starbucks, Oreo and Lego. 4. Not everyone will fancy your message – there will always be people who will comment your post negatively but it’s not necessarily bad for the brand itself. In the case of Lego, situation was completely adverse to the one of Oreo. The brand published posts concerning royal baby on 23rd, July (so the day after) both on Twitter and Facebook. The post on Facebook gained much more activities than the one on Twitter. However, we should remember that people’s reaction will not always be like the one we expect because also vicious comments may appear. 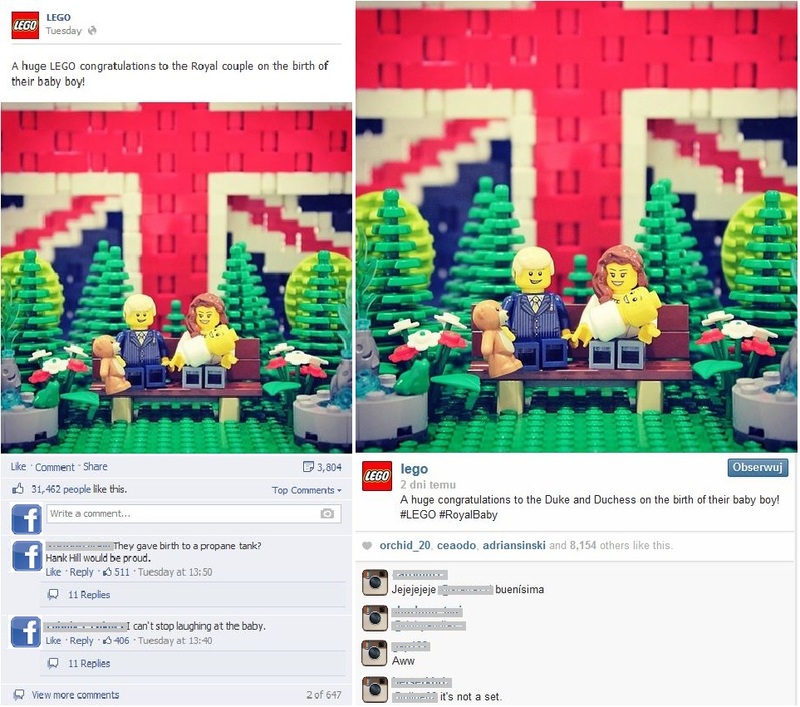 This happened to Lego in the case of royal baby post. 5. Try to be funny and go viral! 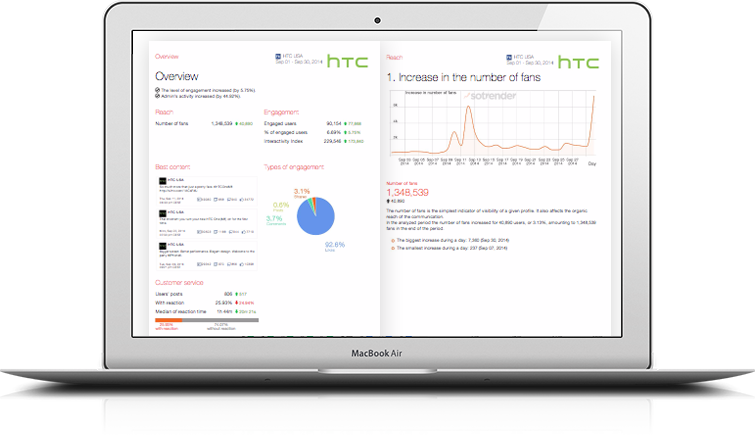 Apart from the direct effects such as the engagement of fans and followers of the profile, the real time marketing actions have also the indirect one – they usually go viral and gain “earned media” as other media are bound to share the content many times. Starbucks which published its posts soon after the announcement of birth is and example of a brand which engaged above average both on Twitter and Facebook. 6. 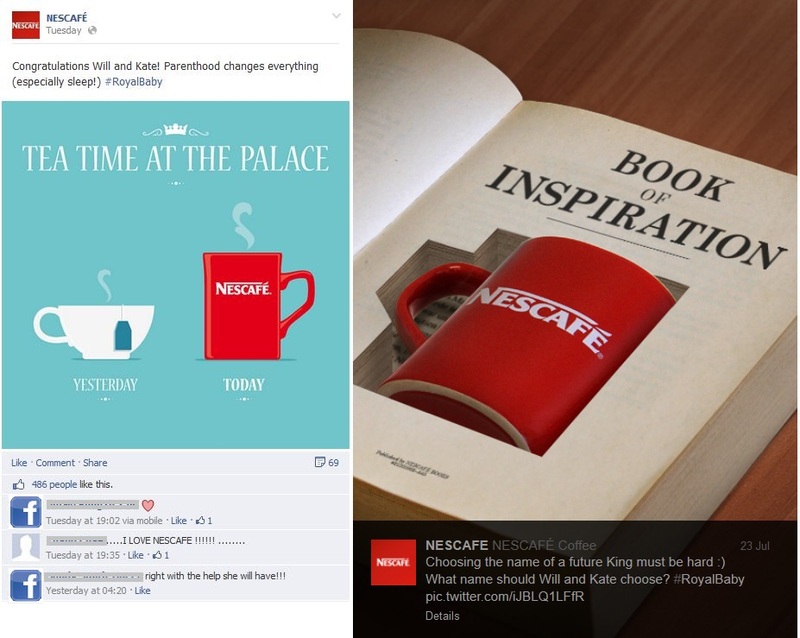 Actions like this are a chance to boost the engagement of your fans – even if not every brand succeeded to do it, as happened to Nescafe the post of which didn’t affect the performance of the brand at all. To sum up, in general real time marketing actions such as publications of post related to royal baby engage more people although some people tend to express their negative feelings towards them, as occurred in the case of Lego. Still, it’s always worth conducting actions of this type.